The Oberaar Glacier at the headwaters of the Aare River is one of the key glaciers whose runoff feeds the complex hydropower system built by Kraftwerke Oberhasli (KWO) from the 1930’s thorugh 1979. The Glacier ended in the artificial lake Oberaarsee created by damming the glacier outflow in 1932. 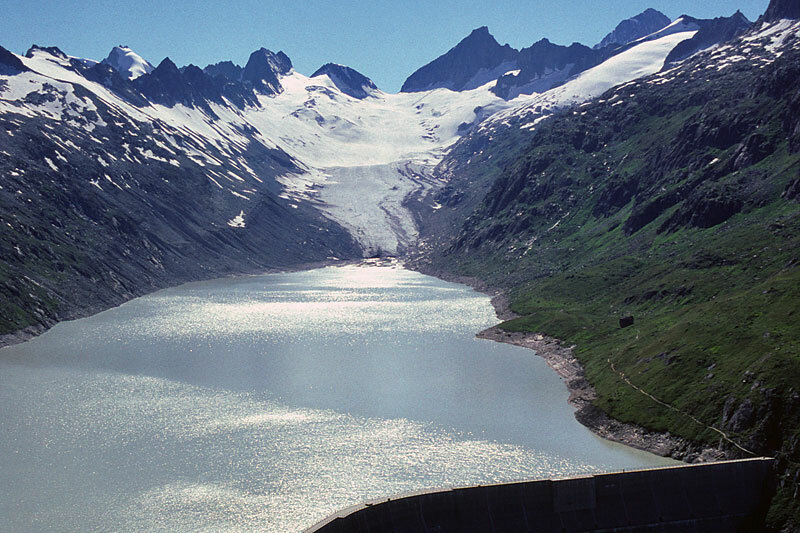 Oberaarsee (O) is dominantly a glacier fed reservoir, which is evident in this 2002 image from Jürg Alean This dam is close to two other largely glacier fed reservoirs Grimselsee (G) and Raterichsbodensee (R). The upper watershed of the Aare provides ideal natural conditions for hydropower generation, abundant water, deep broad glacial valleys for water storage and a 1700 m elevation drop from the Oberaarsee down to Innertkirchen. KWO’s constellation of power plants, seven hydro dams, a natural lake and around 130km of water carrying pipes was completed only in 1979. The total output of the KWO system is 1100MW, equivalent of a large nuclear plant. The network that supplies 7% of the hydropower for Switzerland is fascinating as seen in the schematic below from KWO. Oberaar Glacier has retreated 1500 meters since the building of the dam and now no longer reaches the shores of Oberaarsee. The glacier from 1953-1967 retreated at a rate of 42 meters per year, calving into the lake with the average depth of 17 meters. The presence of the lake enhanced retreat, the glacier velocity was 8 meters per year, while calving retreat was 42 meters per year. The lake did not cause the retreat though, as Gauligletscher the next glacier to the north has experienced a large retreat since 2000. The Swiss Glacier Commission’s retreat history indicate that by the 1970’s the glacier was in shallow water near the edge of the lake and retreat was minor. 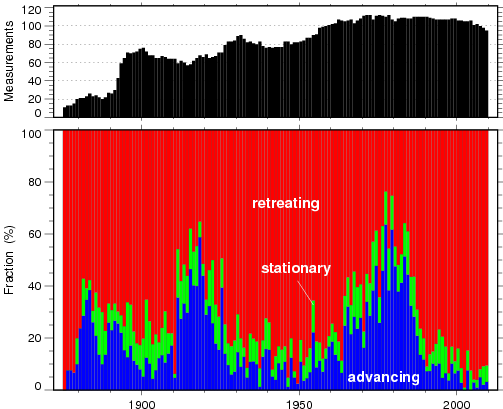 More recently though the lake is no longer enhancing retreat, the retreat rate has again risen to more than 20 meters per year from 1998-2010. 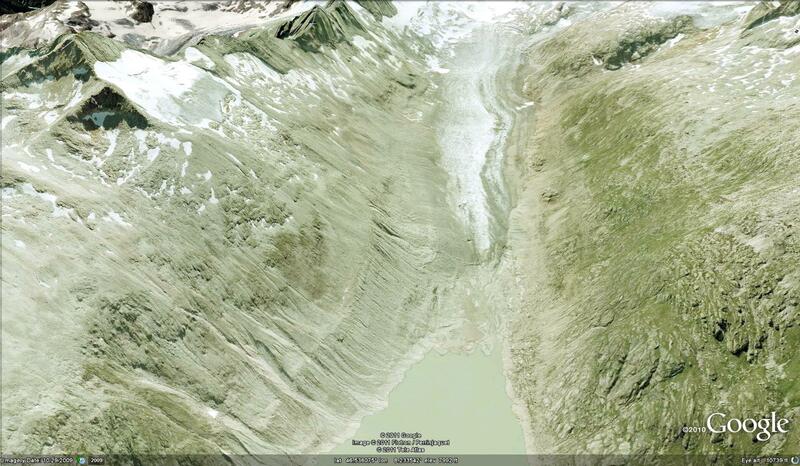 The glacier has retreated 460 meters from the edge of Oberaarsee. By 2013 Landsat imagery indicates the glacier has retreated approximately 1 km from the lake, black arrow indicates terminus and red arrow the end of the stagnant zone. . The Swiss Glacier Commission monitored the glacier surface and found the lower section of the glacier below 2700 meters, thinned by 7.3 meters from 2001-2005 representing a volume loss of 13.5 million cubic meters. Given that lower glacier thickness averages somewhere close to 75-100 meters, this was 7-10% of the glacier lost in four years. Compared to the 1960’s the glacier near the terminus has slowed from 8 to 4 meters per year. It is evident that terminus tongue is thin nearly stagnant moving at 2 meters per year in 2005. The glacier thinning is rapid which is also indicated by the degree to which the lateral margin of the glacier is higher due to the higher debris cover. This occurs only during periods of rapid retreat. The retreat will continue due to the recent snow line rise that has reduced the area of the accumulation zone. The glacier has an icefall at 2800 meters and and above this at 3050 meters is a significant consistent accumulation zone; however not large enough to maintain the large lower elevation glacier tongue. This is similar to all Swiss Glaciers, the average mass balance from 2000-2010 has been consistently and substantially negative as reported to the WGMS, -0.8 meters per year. 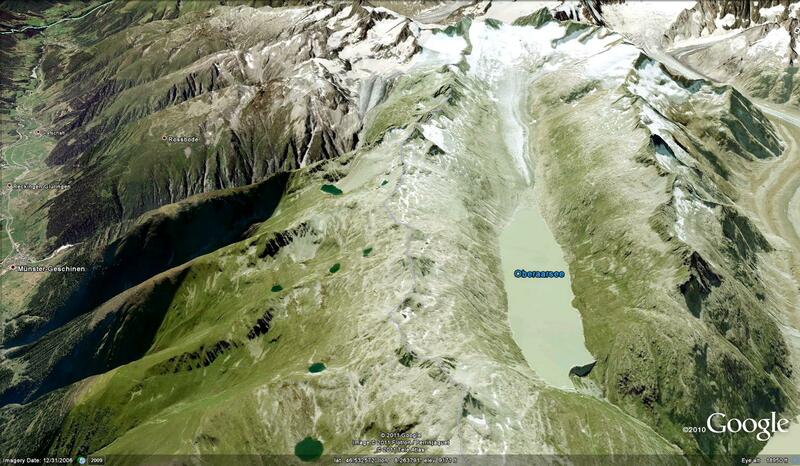 This has led to retreat of 98% of all glaciers in the Alps such as Maladeta, Italyand Ochsentaler in Austria. The Swiss have the best annual terminus survey system and the graph at bottom indicates the percent retreating in red, advancing in blue, and stationary in green. It is clearly a red tide. 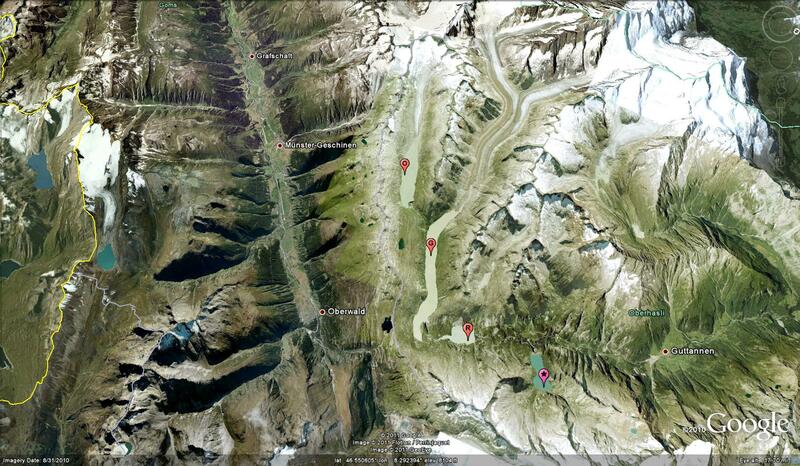 With glacier area loss the summer melt will decline and summer inflow to Oberaarsee will decline. The total annual inflow is determined by annual precipitation and is not changed by loss of glacier area. This decline in natural glacier storage is one reason KWO is contemplating expanding the reservoir storage of Grimselsee. This entry was posted in Glacier Observations and tagged glacier hydropower, Oberaar Glacier retreat, swiss glacier hydropower, swiss glacier retreat. Bookmark the permalink.